NSW Finaliist Stayz Holiday getaways. Our goal was to share our farm with guests to create life long friend and family memories. The feedback and ,moreover, repeat guests we have has been overwhelming - so for our loyal customers who have given us all those 5 star reviews - Thankyou - and we look forward to seeing you again soon. on The Kiama Bends just One and Half Hours South of Sydney. Hidden by Hedges down a Quiet Tree Lined Lane Flanked by a Historic Dry Stone Wall you will arrive at the Fully Renovated Australian Country Cottage on 50 acres of Private Lush Green Farmland Pastures that run down to the Kiama to Gerringong Walking Track on the Sea. The Cottage is fully renovated but retains the Traditional Cottage feel with the Original Polished Floorboards, high ceilings and Cosy Rooms - all with Views over the property and the Sea. Kitchen is fully equipped with beautiful crockery, cutlery, glassware, cooking equipment for a big dinner or a number of meals. There are condiments, tea, coffee for you but also lots of free shelves in the pantry and a large fridge and freezer for all your bits and pieces. Details to know. This is not a hotel in the city! Seaview Farm is a working farm that we love to share with guests - However, like all farms, there is wildlife, animals, reptiles, flora, fauna, fences and dams that come with farms and properties so everyone must be aware not to go near or touch any of the above. Dogs are welcome for an additional charge $25 p/dog/p/n in Cottage Paddock. They are farm fences, not guaranteed dog proof. As it is a working farm please keep dogs on Leash when walking on Farm and do not enter paddocks with stock insitu. There are also electric fences so do not touch - they are marked with signs and the wire is suspended away from the fence. Please access paddocks using only the gates and shut the gates. No paddocks with live stock are to be entered. please ask and we will be able to confirm pending other bookings. At all the properties we are available to help for the duration of your stay. We welcome feedback and suggestions as we want to be the best we can be to enable you to have a happy, memorable and relaxing stay. We have The yoga studio is an additional space available upon request by prior arrangement. We are lucky enough to have guests who have liked our property and then stay at our other properties. The Cottage is part of the Summerbell Escapes group. Please also consider Sea To Sky Farm, Kiama and The Boat House, Gerroa for you holiday. 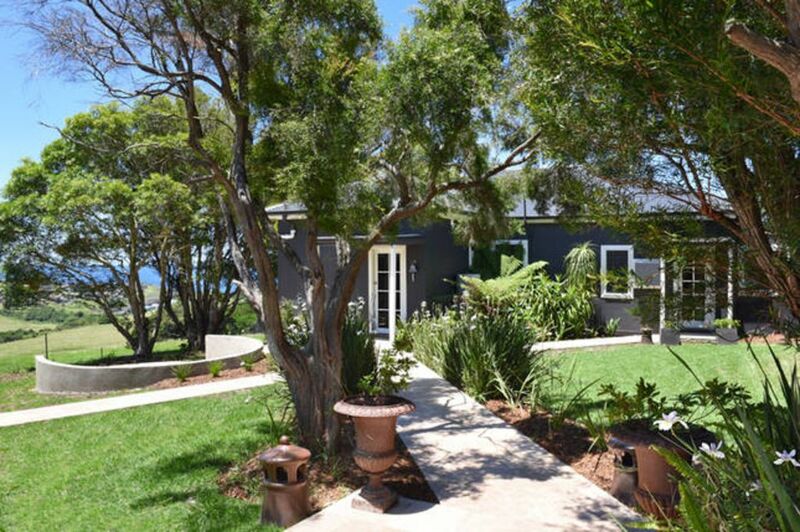 Private access to the Kiama to Gerringong Walking Track with Rock Pools, Fishing Spots on the Pacific Ocean. Fantastic house and property for a weekend away with friends. Highly recommended. Very pleasant location. Comfortable house. Having great guests makes it all worthwhile. We try really hard at The Cottage at Seaview Farm - Summerbell Escapes property- for our guests to create great memories. We had an amazing time at Seaview Farm. With a family of young adults all doing their own thing these days, it’s really hard to find time to catch up and spend quality time together. We had just that on the weekend - the Farm was amazing! Mick’s instructions made it very easy to reach our destination and settle in. We were welcomed with a lovely basket of treats and an absolutely spectacular view. The house was beautiful and very well equipped and met our every need. The only downside was that we had to leave!! We would most certainly return to this magical place. Our poor little dog Mickey looks so depressed now that we’re home- I think he loved it even more than us!!!! Having wonderful guests that we can provide a place to create wonderful memories is So rewarding. Thankyou for your review and look forward to welcoming you back to The Cottage at Seaview Farm or to The Boat House, Gerroa or Sea To Sky Farm. We had an amazing girls weekend away at Summerbell. Mick was so hospitable and made sure that we were happy and comfortable! Such a beautiful property, the sunrise was amazing and the beds were so comfortable! We will be back!! Thank you for such an incredible weekend! Such a great area for all beach and ocean activities.